The NC Barbecue Company is the brainchild of two people. According to his online bio, Pitz, a Virginia native, “became a true NC BBQ convert after having lived in Greensboro, NC for nearly a decade.” His business partner Rick Scott hails from High Point and “was raised on the piedmont style and exposed to the eastern style while in school down east.” Pitz and Scott recognized a general lack of businesses shipping NC-style barbecue, and a specific lack of ones that could ship either Eastern or Piedmont-style ‘cue. It was a simple observation, as is the case with many new businesses (of course, starting a business is not all that simple, but we’ll explore NCBC more in an upcoming BBQ&A with the owners). Back to the Battle Box that started this whole post. The concept is clever: package up Eastern and Piedmont-style ‘cue in one snazzy package that will allow newcomers to NC barbecue to experience both traditions, and to allow old timers to taste test both styles in one sitting. 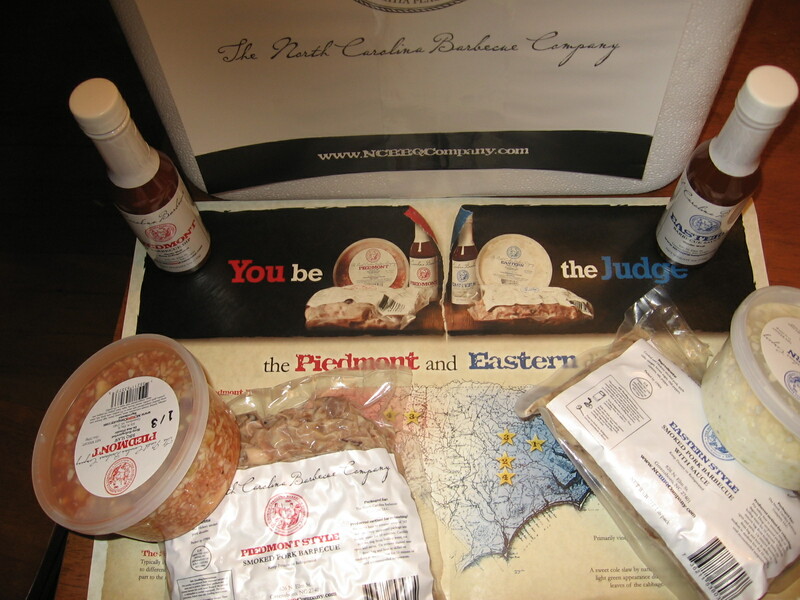 (NCBC also offers pure Eastern or Piedmont boxes, but the Battle Box is their signature item.) The food comes in a styrofoam box that looks like a cross between the kind of cooler you take to the beach when you forget to pack your Coleman and something that is used for organ transplants. Thankfully, there were no human kidneys or livers inside my Battle Box. Instead, the contents were was, in order: a NCBC fridge magnet, NCBC catalog, packing invoice, Battle Box guide/instructions, paper packing material that contained cold but never frozen slaw, bubble-wrapped bottles of sauce, and frozen vacuum-sealed pork perched atop two hefty chunks of well-protected dry ice. 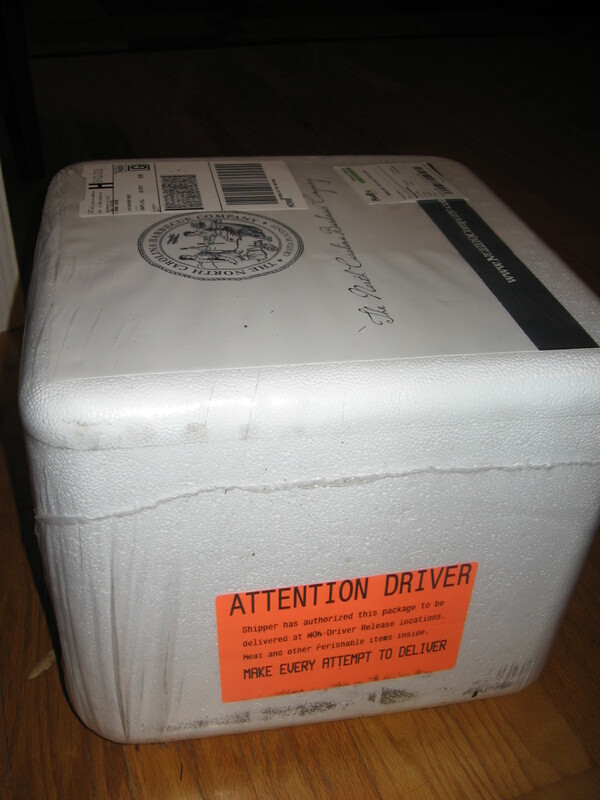 My Battle Box arrived in just a day since I live within an hour of NCBC’s Greensboro address, but the packaging was impressive enough to easily support a cross-country journey (Gov. Schwarzenoinker, are you reading this?). The Battle Box instructions recommended boiling the pork in its wrap to turn it from a frozen block to steaming. That method worked fine, though I found it took a bit longer than advertised to get the meat heated all the way through. The Eastern-style pork is made of a mix of hams and shoulders to simulate the whole hog barbecue for which the eastern part of the state is known, and is pre-sauced lightly. True whole hog barbecue, of course, includes more of the pig than just its shoulders and hams, but NCBC is upfront about that. The Piedmont-style barbecue is made just of the shoulders and is not pre-sauced, which is common (though not universal) practice in that part of the state. The small Battle Box contained 1 pound of each style of pork, which makes for plenty to serve six or more folks. The meat was perfectly acceptable, on par with the meat you get from Brookwood Farms or any of the other major pork producers that sell to North Carolina grocery stores, but not especially memorable. Accompanying the meat was a pint each of mayo-creamy Eastern-style slaw and tangy mayo-free Piedmont-style slaw. Also included in the Battle Box are 5 ounce bottles of Eastern-style vinegar sauce and Piedmont-style vinegar/ketchup dip. I found both the slaw and the sauces to be good representations of the state’s styles, and restaurant-worthy. I hope that in the future NCBC will add hush puppy mix to round out the barbecue holy trinity of pork-slaw-puppies, though you can always throw in your own rolls and call it a meal. Would I recommend NCBC’s Battle Box? Yes and no. 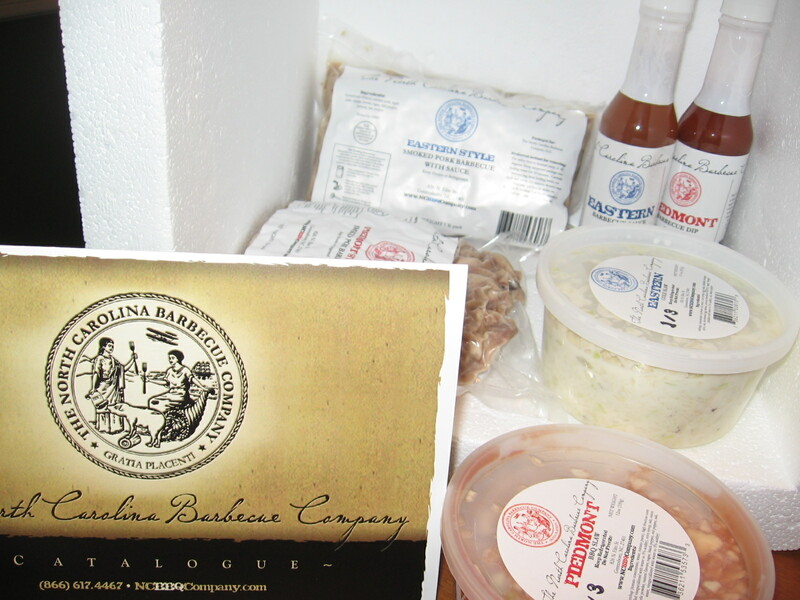 If you live in North Carolina it is not worth passing over your local barbecue joint in favor of the mail order pork sold by NCBC. At $75 including shipping and handling for 2 pounds of pork, slaw and sauces, you could buy a lot of food at your local joint. However, the Battle Box would be a nice taste of home for former Carolinians who live in any of the many far-flung (and “short-flung”) places that don’t offer NC-style barbecue. *For what it’s worth, Pitz never asked me for any free advertising in exchange for his generous barbecue gift.